For the inaugural post of this new blog, I want to highlight a few of the best books I’ve read in the last year. I’ve selected five favorite books from a few broad categories in which I do a lot of reading. I’ve cheated a little, as you’ll see, since it’s always hard to limit myself to a set number, especially when it comes to a really good reading year. These are just a handful of the books I’ve read this year. You can see the rest in my Goodreads reading challenge summary here. Keep in mind that these are my favorites from each category, not necessarily the best—although the two mostly overlap. Sword of Honour, by Evelyn Waugh—The first Waugh I’ve read. Sword of Honour is a trilogy of novels about Guy Crouchback, scion of a failing English Catholic family. Despite already being in his thirties, Guy signs up for service in the British army at the outbreak of World War II, inspired by crusader forebears and a keen, traditional sense of duty. The trilogy is the story of his disillusionment in the face of modern warfare, the totally amoral pragmatism of even the good guys in modern war, and ideology—from Nazism to Communism. It’s magnificent and heartbreaking. Emma, by Jane Austen—Jane Austen’s reputation as a master of manners, motivation, and understanding of the human heart is well earned. To read her is to despair of ever writing anything witty or insightful again. Emma is my wife’s favorite, and I can see why, though I’m still partial to Pride and Prejudice. 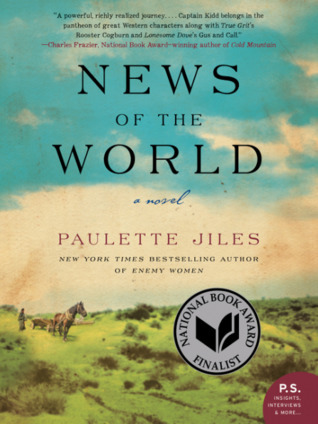 News of the World, by Paulette Jiles—A beautifully written novel set in a fascinating time and place: Reconstruction-era Texas, with the miasma of the Civil War still pervading the air and intermixing with the threat of Indian attack. Jefferson Kyle Kidd, an itinerant newsreader, finds himself saddled with delivering a young girl, the survivor of an Indian massacre and years of captivity, to her nearest living relatives. Brilliantly evocative of its time and place, and it also avoids romanticizing any aspect of Western life. The Black Flower, by Howard Bahr—A magnificent Civil War novel taking place over approximately twenty-four hours at the Battle of Franklin in 1864. The Black Flower follows Bushrod Carter, a young Mississippi infantryman, his comrades, and Anna Hereford, a cousin staying at the McGavock house, destined to become a Confederate field hospital. The battle both unites and separates them in profoundly moving ways. One of the best Civil War novels I’ve read. Bahr has two related novels that I also recommend: The Year of Jubilo and The Judas Field. A Friend of Mr. Lincoln, by Stephen Harrigan—An imaginative story set during Abraham Lincoln’s less well-known early years as a striving lawyer in frontier Illinois. Nutshell, by Ian McEwan—A weird but clever reimagining of Hamlet, in which the melancholy Dane is Claude and Trudy’s unborn child. The Mark of Zorro, by Johnston McCulley—Zorro has been a favorite of mine since childhood, and this is his highly entertaining—and very pulpy—debut. The 1940 film version starring Tyrone Power is also excellent. Duel: Terror Stories, by Richard Matheson—A bit of a cheat, since I haven’t quite finished this book yet, but it’s a great collection of short fiction by an underappreciated master of the genre. The title story is excellent, the this collection includes several other really good ones, including four or five that served as the basis of “Twilight Zone” episodes. The Fall of Berlin 1945, by Antony Beevor—A deeply depressing but necessary study of the last two or three months of World War II in Europe, the nearest I believe we’ve ever come to literal hell on earth. Brand Luther, by Andrew Pettegree—A view of Luther through his relationship with print. Turns out Luther was persnickety about more than indulgences, Zwingli, rebellious peasants, and the Jews—he demanded quality printing and exercised tight control over not just the content but the presentation of his books. I was more genuinely interested and learned more from this book than many others I’ve read in the last few years. Outstanding. The Earth is Weeping: The Epic Story of the Indian Wars for the American West, by Peter Cozzens—An excellent narrative history of the Indian Wars that presents all sides fairly, good and bad, and avoids ideological axe-grinding. It’s also a thrilling read, which isn’t necessary in a work of history but is always appreciated—especially as rare as it’s become today. The Second World Wars: How the First Global Conflict Was Fought and Won, by Victor Davis Hanson—An engrossing topical history of World War II. Hanson analyzes the war from a variety of angles—command, leadership, armor, siege warfare, naval power, air power, industrial production, and many more—rather than chronologically, and pulls on some fascinating threads in order to approach the war from a fresh angle. I had the chance to interview Hanson just before Thanksgiving and hope to post a link soon. The Autobiography of Frederick Douglass—Justly regarded as a classic. Douglass’s spare, unadorned prose, his brutal narrative, and his unflinching moral lucidity should be a challenge to any reader. Summer of Blood: England’s First Revolution, by Dan Jones—An excellent short look at the Wat Tyler rebellion, a brutal peasant uprising from the south of England crushed by a young Richard II in 1381. Communism: A History, by Richard Pipes—An excellent short history of Communism. Pipes does not back away from pointing out what should be obvious—the problem with Communism is, and always has been, Communism. Shooting at the Stars, written and illustrated by John Hendrix—A beautifully illustrated account of the 1914 Christmas truce, one of the few bright spots in the miserable opening act of history’s bloodiest century. The Silver Chair, by C.S. Lewis—A classic that should need no introduction. For all the Lewis I’ve read, I still haven’t read all of the Chronicles of Narnia. I’m one step closer to fixing that. Puddleglum should rank as one of the great characters of twentieth century fiction. The Tale of Troy, by Roger Lancelyn Green—Excellent distillation and adaptation of the myriad Trojan War legends. Several passages, for all their brevity in this form, are still quite moving. Twenty and Ten, by Claire Huchet Bishop—A favorite from fourth or fifth grade, the story of twenty French Catholic school children who come together to protect ten Jewish children from the Nazis during World War II. Pompeii: Buried Alive! by Edith Kunhardt Davis, illustrated by Michael Eagle—A very good account of the destruction of Pompeii suitable for young readers. What attracted me to this book was the illustrations by Michael Eagle, who also illustrated The Trojan Horse, one of my favorite books as a child. How to Grow Old, by Cicero—A translation of De Senectute (On Old Age), one of a batch of philosophical treatises Cicero produced in his last two years of life. A very good meditation on aging—not just consolation as one grows older, but encouragement to embrace the changes and positives of age in accordance with the Stoic principles of Reason and Nature. Excellent. The Saga of the Volsungs, translated by Jackson Crawford—An excellent new translation of one of the great pieces of Norse literature, the source of most of our stories about Sigurd, the dragon-slayer, and his violent family. This edition includes a sequel of sorts, The Saga of Ragnar Lothbrok, which I had never read before. If you haven’t subscribe to Crawford’s excellent YouTube channel and follow him on Twitter. He’s one of the best academic social media presences out there. Jason and the Argonauts, by Apollonius of Rhodes—A fun adventure from the Hellenistic Age, combining subversion of literary convention with real excitement and pathos. It’s also short compared to something like the Iliad, so if you’re trying to read some classics but you’re on a tight schedule, check it out. Beowulf, translated by Stephen Mitchell—A good new translation of one of my favorite books. I still prefer those of Seamus Heaney or Michael Alexander, but this is a solid new one and was good excuse for me to reread it over Christmas. The Aeneid, by Virgil, translated by David Ferry—My second cheat of this list. I got this acclaimed new translation with my Christmas money and have been enjoying it since. It’s been better than a decade since I read the Aeneid, and that’s too long. This coincided with my grandfather’s passing at the age of ninety, and so fathers, leadership, and honor have been on my mind. Virgil is excellent food for the soul under those conditions. I planned to cover a few books I reread this year, but this piece is quite long enough already. I’d be remiss if I let this opportunity pass to plug a book I read and reread several times this year as I prepared it for publication—Dark Full of Enemies. Please do check it out if you’re interested, and let me know if you do. I hope it’ll be an entertaining and thought-provoking adventure for you. I’m looking forward to the new year, to new projects of my own, and to new books to discover and read. I hope you’ve all had a merry Christmas and that you have a happy new year!